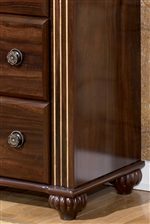 This graceful chest of drawers takes the functionality and storage capabilities of the coordinating nine drawer dresser and fashions them into a stylish piece that tucks neatly into smaller spaces. 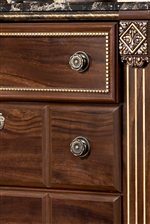 A framed drawer with gilded bead detail tops four equally spacious drawers crowned with antiqued gold knobs. A black marbled top further enhances the traditional look of this five drawer chest and provides a durable resting place for decorative items. 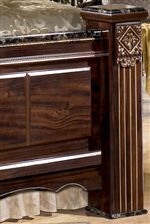 The same fluted bun feet featured on the end table and nine drawer dresser are continued in the chest for a harmonious look. Place in a corner and use to hide bed linens and bulkier clothing items out of sight, or pair with the coordinating nine drawer dresser and end table to make the most of your space. The Gabriela Chest with 5 Drawers and Marbled Top by Signature Design by Ashley at Casa Leaders Inc. in the Wilmington, Long Beach, Torrance, Lakewood, Los Angeles area. Product availability may vary. Contact us for the most current availability on this product. 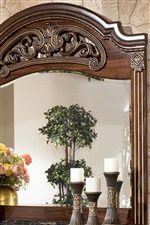 The Gabriela collection is a great option if you are looking for Traditional furniture in the Wilmington, Long Beach, Torrance, Lakewood, Los Angeles area. Browse other items in the Gabriela collection from Casa Leaders Inc. in the Wilmington, Long Beach, Torrance, Lakewood, Los Angeles area.